Instead of delivering his mail, 67-year-old mailman Joseph Brucato has been keeping it hidden; in his car, home and locker. After arresting Brucato on Wednesday investigators uncovered approximately 40,000 pieces of First Class, priority and regular mail, weighing in at over a ton, about 2,500 pounds, according to the formal complaint filed in Brooklyn Federal Court. It has not yet been revealed if the residents and businesses along his mail route ever complained about not receiving their mail, but the filed complaint states that some of the undelivered mail found in Brucato’s possession date back to 2005. Suspicion was aroused on September 22 when Brucato’s supervisor saw mail inside the mailman’s car which was parked outside Ryder Station in Flatbush. The day after agents from the office of the inspector general asked Brucato about the mail in his car. Brucato answered that yes, “he has been keeping mail there for at least six months and that on some days he did not deliver the mail intended for his route for personal reasons” Special Agent Michael Wu stated in the complaint. Magistrate Vera Scanlon released Brucato on his own recognizance. He was ordered, however, to “abstain from excessive alcohol consumption” as stated in the court documents. Heidi Cesare, Brucato’s lawyer, told the judge that he suffers from depression. In the meantime Brucato has been suspended from his job at the Postal Service, without pay. 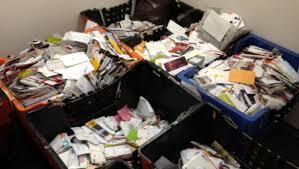 A postal service spokeswoman said that she did not know yet when the hoarded mail would finally be delivered to their rightful recipients.